Has WWE ever had this many different authority figures at one time? You have the oft beleaguered William Regal, tasked with watching over NXT in Triple H’s stead. Over on the main roster, there’s the hands-off Shane McMahon and his trusted lieutenant Daniel Bryan on Smackdown Live. The most interesting of the pack, though, can be found on Raw in the form of commissioner Stephanie McMahon and general manager Mick Foley. When Foley came on board during the brand split, McMahon had initially treated him as an equal, stating explicit trust in him to make matches and run the show. However, their partnership has slowly deteriorated over the past seven months, with her often overriding his decisions and berating him for going against her’s. It came to a head this week on Raw, with the two arguing over McMahon’s involvement with Triple H, the recent signing of Samoa Joe and Foley refusing to step in during Stephanie’s confrontation with Bayley and Sasha Banks. The portrayal of Foley and McMahon being at odds like this reveals a lot about both characters. Not just from a story perspective, where there’s a clear divide in the main event scene over who is trusted by the mostly invisible Triple H to carry the company and who isn’t, but also in terms of how McMahon’s character compares to not just Mick’s, but her brother Shane’s as well. As previously mentioned, the authority figures on Smackdown Live manage from a distance. Shane is rarely seen on TV, and when he is, he’s treated like the audience’s cool friend. If matches have to be made either in the ring or backstage, it’s not long until “Flight of the Valkyries” plays and the straight-shooting Bryan comes out to flights of “Yes” chants. Foley tends to be the matchmaker on Raw for the most part, but it doesn’t take much—or long—before McMahon comes out behind him and micromanages his every move. Telling Sami Zayn he has to earn his spot in the Royal Rumble match or telling Foley his performance review hinged on procuring the Undertaker are recent examples that come to mind. It’s innocuous on the surface, considering the fact that McMahon has always been a heel character. On further inspection, though, you have to wonder why the only woman authority figure currently in WWE oscillates between two unflattering depictions: either she’s the uptight wet blanket determined to ruin Foley’s attempts to please the audience, or she’s the secret right hand of The Destroyer Triple H. You can argue that she’s playing a heel, but how many times have they tried to portray this ostensible heel in a positive light on Raw when the story (or promotional attempt) calls for it? For a company that claims they’re trying to improve the portrayal of women, WWE really hasn’t strayed far from the shrill and cougarish Vickie Guerrero and the manipulative and vindictive AJ Lee in their portrayal of woman authority figures. Foley’s desire to give the audience what it wants often contradicts McMahon and the “corporate knows best” attitude that has run rampant since her time in The Authority. 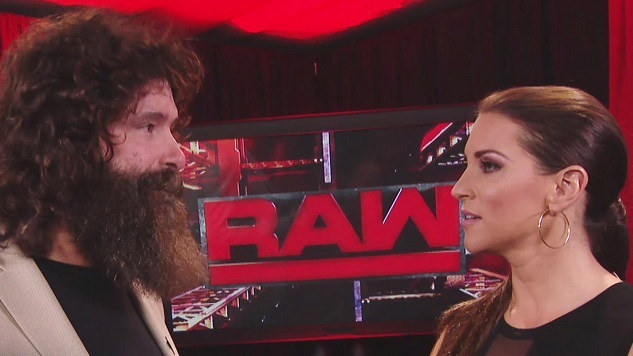 Their relationship reflects the real life struggle between fans and WWE’s booking—Foley, the legendary fan favorite, wants to give fans what they want, but his boss, a proud McMahon, needs to leave her own personal imprint upon the product, even if it runs counter to the fans. In the end, we all know who’ll win.